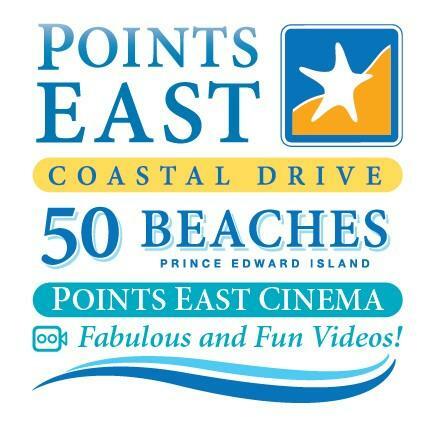 Eastern Prince Edward Island is a place for happy memories. It’s the gentle flap of a screen door hitting the frame, it’s where - regardless of age - you feel free to wriggle your toes in the sand and it’s a place where people smile for no reason. It’s the perfect decompression chamber, where you can harvest mussels, go clam digging, join a floating ceilidh, have a seaweed lunch and a lobster dinner. For the environmentally and ecologically conscious, Eastern Prince Edward Island provides all of this in a compact area. Here a tank of gas goes a long way in sampling an extensive menu of simple pleasures. And while the 100-Mile-Diet is all the fashion, in this self-sustaining part of the world, you can accomplish the 10-Mile Diet. You’ll pass by fields, farms and wharves where all the items on your plate - the potatoes, vegetables, meats and fish – are grown or harvested. And you’ll be able to wash it down with wines from the Island’s only winery or spice up your evening with local gin, vodka and moonshine from an artisan distillery. To guide you through this quiet Island gem, employ the region’s six premiere lighthouses to guide you from one adventure and discovery to the next. The journey begins at the Point Prim Lighthouse. 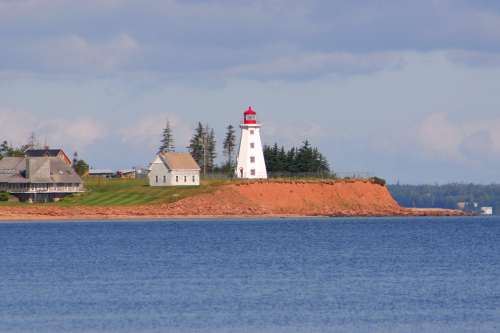 Built in 1845 on a finger of land separating the Northumberland Strait from Hillsborough Bay, Point Prim is the Island’s first lighthouse, and the only round brick lighthouse in Canada. Designed by Isaac Smith, who built the provincial legislature, Point Prim is pristinely romantic. Outside your eye follows four perfectly aligned windows, like buttons on a crisp white shirt, up to the red light room on top. 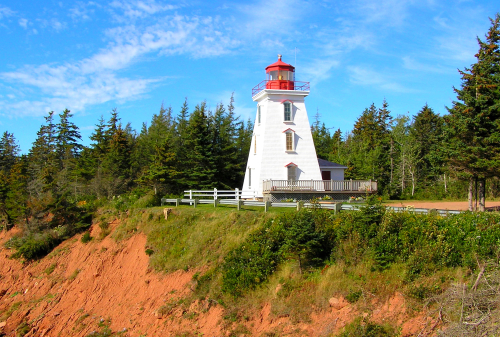 And, like all of the premier lighthouses in Eastern PEI, you are welcome to explore the interior and climb to the top. 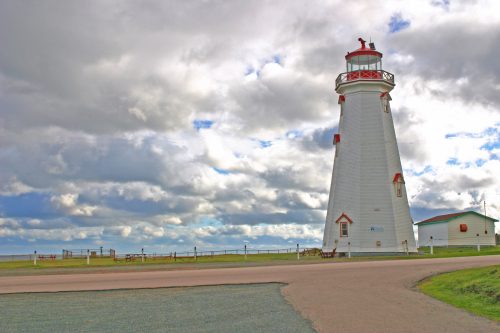 On the road from the lighthouse to the TransCanada you’ll pass by tidy properties, which are typical on PEI, with various lawn decorations from flowers spilling out of a barrel to dories, anchors and lobster traps adding a sculptural effect to the landscaping. But one house has seemingly adapted a Christmas idea and decorated their front lawn fruit tree with colourful buoys which twist in the seabreeze. This area is the first hint of the strong Scottish roots in Eastern PEI. There is the Orwell Corner Historic Village, the Sir Andrew Macphail Homestead, Polly Monument to the Selkirk settlers, Croft House Selkirk Cultural and Heritage Centre, Lord Selkirk Campground, and Polly Pioneer Cemetery . Our second light on this trail is the Wood Islands Lighthouse. It’s located on high-ground beside the ferry terminal, over-looking the working fishing port. In the light’s 11 theme rooms you’ll learn about everything from Mermaid’s Tears to rum running. PEI was one of the rare Canadian provinces to embrace Prohibition, which provided an income opportunity for a lot of boat owners. And in the light-room, which gets so hot, visits are limited to minutes, you can look down on two miniature copies, “the range lights” which guide the ferry from Nova Scotia into the dock. 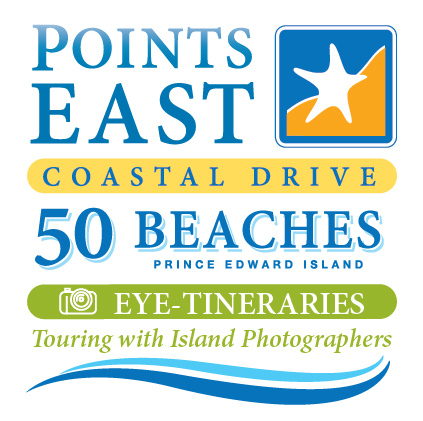 While the lighthouse team works to provide interactive experiences and events from twice-summer-moonlight tours to ceilidhs and their Taste of PEI, where they tease the palate with a snack based on daily dip into old Island recipes, the most compelling display deals with the phantom Burning Boat. For over 200 years, residents of this end of the Island have seen a burning ship at sea. The last reported sighting in 1978 was so believable that the Northumberland Ferry was sent out to aid the burning ship, only to realize they had been deceived by the phantom. Leaving Wood Islands, the drive takes you along a coastal route, where you’ll find the Rossignol Estate Winery, which welcomes visitors for tastings and wine pairing suggestions. It’s a fun drive because you really see the marriage of land and sea. Here farm fields disappear into the bright blue waters of the Northumberland Strait. Farmers on tractors putter across their fields, as fishermen in boats on the waters beyond, pull in their lobster pots. At the Cape Bear Lighthouse a viewing area allows visitors the rare chance to see a profile of blue water, red cliffs and white lighthouse. Like many, the Cape Bear Lighthouse has been moved from its original setting, which is now in the water, thanks to erosion of the shoreline. When it was moved in 1946 – using just a single horse – the living quarters were cut off the light and moved down the road for use as a cottage. Among Cape Bear’s significant historical connections is the Titanic. Since Cape Bear was a Marconi wireless station, it received one of the first distress calls from the liner on that night in April 1912. The operator at Cape Bear handed the message on to others, who began the search for survivors. Leaving Cape Bear, we take highway 18 to the Murrays. First Murray Harbour, then Murray River. At the wharf in Murray River you’ll find outfitters providing sea kayaking, canoe and land-based adventures. From here it’s another head-turning drive past fishing wharves, farms, fields and stands of silver birch to the Panmure Island Lighthouse. In the third weekend of August, this small island, which has a resident population of 50, welcomes as many as 5,000 visitors to the Abegweit PowWow. 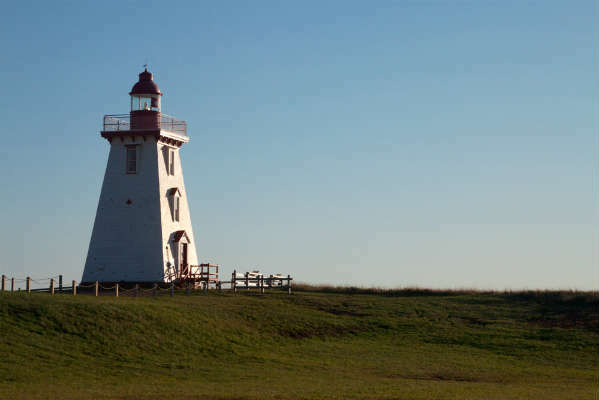 The Panmure Light was built in 1853 and a century later, the island was connected to the main part of PEI, by a causeway. This created a sandy dune and a great beach for sunning and snapping photos of the lighthouse glistering on a green plateau at the end of the causeway. The first wooden light built on the Island, it was built like a ship. As a consequence, there are very few nails in this lighthouse. It’s a masterpiece of ship-like joinery held in place by wooden pegs. Even the windows are held in place by wooden slides. In a way, it’s like a large puzzle. You wonder if the right peg were removed if it would come crashing down. Panmure is an important light because it guides vessels on the Montague, Cardigan and Brudenell rivers. The three rivers were designated Canadian Heritage Rivers in 2004. Driving from Panmure to Montague, on Highway 17, is a treat. In the line of trees which line the road there are breaks that seem artist-inspired because they so perfectly frame the landscape that it’s impossible not to take great photographs. Further up, at the Sturgeon wharf photographers will want to snap shots of the thousands of faded buoys piled alone the shore. In nearby Georgetown, visitors will find more accommodations, summer theatre and a former mayor who makes jewellery out of Island sandstone at Shoreline Design. The road to the final light on this trail traces the shoreline from Cardigan to East Point. This is where you’ll find the artisan distillery, Myriad View Artisan Distillery in Rollo Bay and The Inn at Bay Fortune, serving salmon smoked in cinnamon. 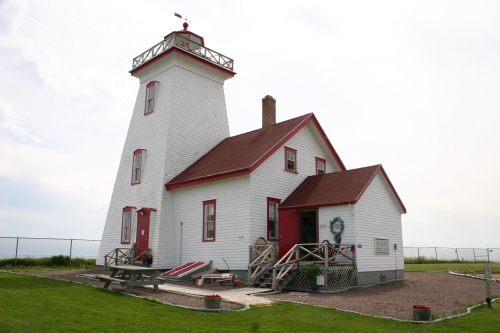 You’ll find hiking and cycling trails, and a strong Acadian culture clustered around Souris. The shoreline north of Souris is famous for the “signing sands” at Basin Head beach. When dry, this round-shaped quartz sand can be scuffed and it makes a sound. You won’t exactly find any recognizable songs, but you will get to play with a natural wonder. 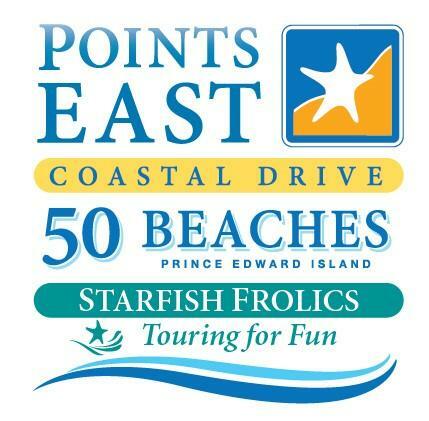 In truth, much of this coast has the same sand composition, so you can pretty make them sing all the way to your final destination at the East Point Lighthouse. 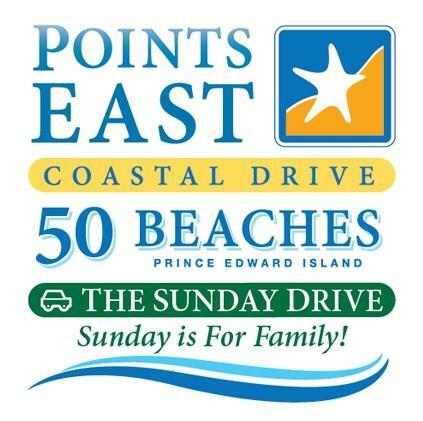 Just before East Point, it’s worth a small detour to the Elmira Railway Museum, which offers rides on its mile-long miniature railroad, as well as showers to cyclists who have come off the Confederation Trail E. Elmira is the end (or start) of the best cycling trails in Canada. The Confederation Trail can lead cyclists from one tip of the Island to the other, or you can ride it past St. Peters to Mount Stewart, then cross over to Georgetown and Montague. A separate trail runs between Murray Harbour and Stratford. Many cyclists like to ride loops, combining these well-marked trails and the near-deserted roads to discover everything from buffalo herds to the best place to have hand-cut French fries washed down with a strawberry cordial. Those who make it all the way to the East Point Light, whether they come by two or four wheels will find treats like lobster chowder and lobster burgers at the lighthouse’s cafe. At the East Point Lighthouse visitors can see where the Northumberland Strait, Gulf of St. Lawrence and Atlantic Ocean meet. They can also eavesdrop on the sometimes “salty” candid conversations between ships’ captains over the two-way radio. While not always family-rated, it allows staff to inform visitors when tuna are about to be landed at the North Lake Harbour wharf. The East Point Light has a quirky history. Alexander Beaton, a wealthy landowner, swapped the land for the light in exchange for the light-keeper’s position for himself and his heirs in perpetuity. On this Beaton out-smarted himself. He never married and never had children, so the contract was void. The East Point Lighthouse is a pre-confederation model, made by a self-taught local man, who normally built barns. The eight beams which rise from the floor of this octagon tower are 45-foot-long single logs of black spruce which cause Islanders to marvel that the place ever had trees that tall. Like several of its companions, the East Point Light has twice been moved, which resulted in unanticipated serious consequences. In 1882 HMS Phoenix was stranded and wrecked on a reef off East Point. The Captain was charged in Admiralty Court in London with neglect. However, it was proven that while he read his charts correctly, they were useless because their reference point, the lighthouse, was in a different position. The captain was acquitted. Lighthouse lover, history buff, foodie, honeymooner or family on holiday, these lights will guide you to a diverse community of French, Acadian, English, Scots, Irish and Native Peoples who are more than willing to share their best with you. You’ll discover a place to inspiring sunrises and where it’s still possible to see the stars. And you’ll discover that small places can provide the best memories.